Holy Island was one of the principle centres of Christianity during the Dark Ages. The castle you see today is a Tudor castle later remodeled by Sir Edwin Lutyens to form a dramatic private house, now open to the public. It has been the location for many film shoots, from James Bond to the Scarlet Pimpernel. While on the island take a look at the pub, the remains of the medieval Priory and walk along the sandy beaches. Use the tide table before crossing the causeway. Flodden Field is the site of the greatest battle ever fought in the region. On 9th September 1513 it is estimated that 30,000 men died here, in a crushing English victory. Located on the border between Scotland and England, Berwick-upon-Tweed is the only entirely walled town in Britain – a fact that reflects its bloody history. Berwick's walls were built for Queen Elizabeth I and designed by the same man responsible for those surrounding Lucca in Italy. It is possible to walk around the top of the walls, which offer excellent views over Berwick's historic properties and out to sea. 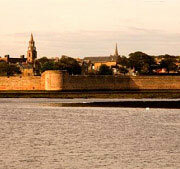 The town is the scene of several well-known paintings by LS Lowry and there is a marked 'Lowry Trail'. The barracks museum is also of interest. The building was formerly the home of the King's Own Scottish Borderers and was designed by Sir John Vanbrugh, architect of Blenheim Palace and Castle Howard. Eyemouth has been a fishing port since the 13th century and remains one of the busiest in Scotland, with around 80 boats. You can experience the atmosphere of a busy working fishing port up-close, and also witness the fishmarket if you get up early. Visit Gunsgreen House, a remarkable property that overlooks the harbour and was a smugglers' hideaway. Take a trip in the glass-bottomed boat or a thrilling rib trip. There is a sandy beach with rock pools as well as amusements, Try Giacopazzi's ice cream, alongside a variety of good local shops. The village of Coldingham combines historical charm with beautiful beaches and walks. Start at the visitor centre called the Luckenbooth beside the historic ruin of Coldingham Priory and wander around the village before heading towards the beach and following the coastal trail. Coldingham has great surfing and surf equipment and canoe hire is possible at the surf shop. A few miles down the road, the fishing village of St Abbs is a National Nature Reserve and a favourite location for divers, birdwatchers and walkers. The St Abbs Visitor Centre is worth visiting for further information about the area. A visit to Cove's historic harbour is like stepping back in time. Park at the top of the cliff in Cove village and pop out at sea level via a tunnel carved through the solid rock. The harbour is still used by small boats collecting lobster pots. The cliff-top path heading South East leads to Pease Bay, under 1km away. Siccar Point is the unlikely birthplace of modern geology. Professional and amateur geologists will travel across the world to see this place, known to them as 'Hutton's Unconformity'. Even if the scientific history doesn't excite you, the beach walk and wild landscape is worth a visit. Walk East from Pease Bay along the shore for about 1km. This is the longest of Scotland's walks at 212 miles and traverses the whole border country from Portpatrick in the West to Cockburnspath in the East. Passing just north of Duns and Eyemouth, the Longformacus to Abbey St.Bathans stretch is particularly beautiful. A significant part of the Duns Castle estate is open to the public, providing extensive walks. Climb Duns Law or take a walk around the entertainingly-named Hen Poo, which is actually a pretty landscaped lake with ducks and geese. or Tweed Salmon Fishing, Tel: 01573 470 612. For the River Whiteadder contact Game Fair, Tel: 01289 305 119.
or Watch Water Reservoir, Tel: 01361 890 331. Dinghy sailing, canoeing, windsurfing and angling. Manderston was the last great country house to be constructed in Britain. Built for the construction magnate Sir James Miller on an apparently unlimited budget, Manderston has the only solid sterling silver staircase in the world. Mellerstain House was built by William Adam, father of brothers Robert and James Adam –the architects who built Wedderburn Castle. Although started in 1725 Mellerstain was not completed until 1778 (three years later than Wedderburn). Robert Adam's fine interiors at Mellerstain are of particular interest. The original power base of the clan, Hume Castle has the finest view in the Borders and is a rare example of the remains of a 13th century castle. The walls you see today are a folly constructed in 1794 for the last Earl of Marchmont, but this doesn't matter as the site is awe-inspiring. Started in 1128 and completed in 1243, this is perhaps the finest example of Romanesque architecture in Britain. While in Kelso, it is worth taking time to enjoy the town square, shops and Floors Castle. Floors is the seat of the 10th Duke of Roxburghe. The magnificent building was started in 1721 to a design by William Adam (the father of Robert and James Adam who designed Wedderburn Castle) and later remodeled by William Playfair. A stark and well-preserved 15th century tower house that is open to the public. Smailholm is said to have inspired Sir Walter Scott who lived nearby as a boy. Norham Castle stands on the river Tweed, at the border, and is reckoned by English Heritage to be 'one of the most impressive medieval fortresses in northern England'. It is recorded that one day In August 1497 King James IV sat by the South bank of the Tweed playing cards with the Spanish Ambassador while returning from a raid into England. King James found that the river Tweed had risen at the ford and made a vow that if he and his men got safely over he would build a Kirk to Our Lady that 'fire would not burn nor water destroy'. 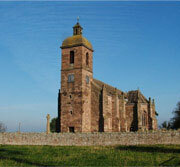 Thus Ladykirk, church was constructed entirely of stone – even down to the roof. Paxton House is an important 18th century Palladian country house built on the banks of the river Tweed for Patrick Home – who also built Wedderburn Castle as you see it today – in 1758. Paxton was designed by John Adam, interiors by Robert Adam, and the house contains a fine collection of furniture by Chippendale and Trotter. The picture gallery displays paintings from the National Galleries of Scotland. The grounds are well worth exploring and include an adventure playground for children. Following the banks of the River Tweed you may see otters and the Union Chain Bridge, which is the oldest road suspension bridge in the world, constructed in 1820. Blue Sky Cottages, Duns, Berwickshire TD11 3LT T. 01361 882 190 E.